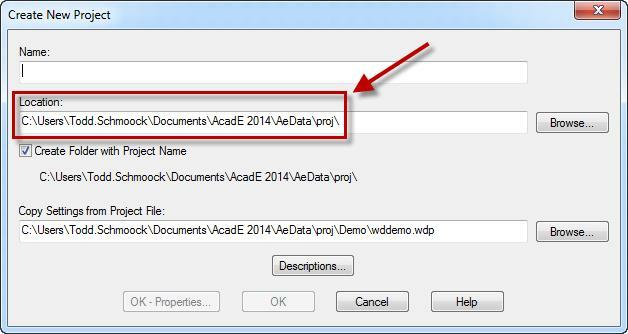 AutoCAD® Electrical uses what is called an environment file (wd.env) to control where the software retrieves data. 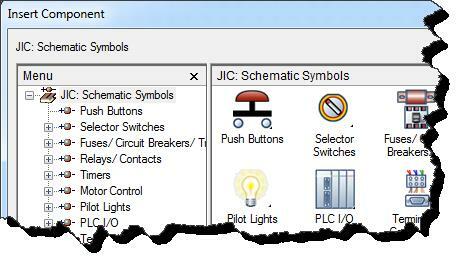 Some of the functions include where AutoCAD Electrical looks for vendor part numbers located in the databases, where the library is located for various symbols used, and where the menus files are located that allow you to choose the schematic symbols. This document will explain some of the most important areas of the environment file you should consider making changes to. There are additional areas you should consider changing, or turning on, but they are beyond the scope of this document. The wd.env file is located under the AeData folder, and is typically under the user’s documents folder location unless this was changed during installation. A typical location is “C:\Users\ User login \Documents\Acade 2014\AeData\”. Use notepad to view and edit the wd.env file. If an asterisk (*) is in the beginning of a line it will be ignored by AutoCAD Electrical. This allows you to add comments and notes while editing the file. To turn on an option you will need to remove the asterisk so AutoCAD Electrical will read that line. The first areas to consider are the default locations of the databases, and the support locations. Most users prefer to leave these set to the defaults in the environment file. For example, each user has a support and a temp folder, and it’s best to leave this set to the default install locations. However, the databases can be moved to a server location and the path can be added to AutoCAD Electrical’s options under the files tab, but you would not change anything in the environment file. Copy the AeData folder to a server location. Rename or delete the default location at: “C:\Users\ User login \Documents\Acade 2014\AeData\” so electrical will not find it there. You can also remove this path from to options if you prefer. Create a new folder under the Libs folder and name it something like “Company Symbols”. This is where you will place all symbols you create. NOTE: Do not put your custom symbols in any of the default folders. When you migrate to a new version of the software you could overwrite the existing folders with the new versions folder. Several users have already had this happen to them. Replace all the %SL_DIR% text shown above with the server address, and add a path to the newly created “Company Symbols” folder. When AutoCAD Electrical reads this it will go to the server location to retrieve symbols when you select them from the Icon Menu tool. NOTE: There are more options in this section you may want to turn on, but it is beyond the scope of this document. Determine where you want to store your projects. 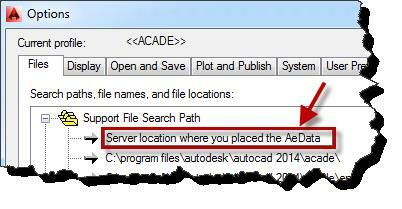 This is typically a location you are already using when you worked with standard AutoCAD, but it can be a new location. This will save you time by not having to browse too far when a new project is created. Determine where you want to store your menu file data. Making a folder on the server called “AutoCAD Electrical Resources” is one option. Then, create a subfolder called “Menu Files”. Determine which *.dat files you will be using, or create a new one. The first line is for the schematic symbols icon menu. The second line is for the panel icon menu. Once you have the files figured out change the names in each line to reflect the correct file. Remove the asterisk from the beginning of each line to turn on the option. NOTE: There are several files AutoCAD Electrical uses to populate the icon menu. There are *.dll, *.slb, and *.dat files which are in the default user’s support folder, and the program files support folder. Search for these files and place them all in the new “Menu Files” location you made. As mentioned earlier, there are many more areas you will want to modify and turn on in the environment file to make working in AutoCAD Electrical more enjoyable, and save you time by reducing the amount of clicks. Think of this document as the first steps to take when trying to share data with your group. Even if you are the only user, making these changes will make it easier for you to work in AutoCAD Electrical by avoiding those crazy default paths, and will save you time by reducing the amount of clicks. As you get better with AutoCAD Electrical you can explore other options to modify and turn on in the environment file. Todd has over 25 years of experience in the mechanical engineering field. Ten years of his time was spent as a documentation specialist/designer at Honeywell, Inc., working on several government contract which required strict drafting and design documentation in accordance with government standards. Todd joined Synergis in 2003 and he regularly presents classes as Autodesk University. Todd is a graduate of Delaware Valley College in Doylestown, Pa. He has over 20 years experience in the mechanical engineering field. Ten years of this time was spent as a documentation specialist/designer at Honeywell, Inc. where he worked on several government contracts which required strict drafting and design documentation in accordance with government standards.